As the signal hits the load, the difference in impedances causes part of it to “bounce back” or reflect from the load. How much depends upon the mismatch; no mismatch, no reverse wave. The reflected signal, which is actually inverted from the original, travels back toward the source (the reverse signal). Now, Figure 1 shows a periodic pulse train that might be produced by a string of digital data that simply alternates (0,1,0,10,1…) every 250 ns (4 Mb/s). Red is the original signal from the source, blue shows the reflected wave (1/10th amplitude and 180 degrees out of phase), and green shows the resulting pulse train. I have deliberately placed the edges of the reflected wave coincident with the edges of the forward (source) wave. Figure 1. Periodic pulse train. Now, reducing the amplitude has to change the edge (slew) rate, so this could cause the actual center (zero) crossings to move. That would cause jitter. However, as Figure 2 shows, for an ideal periodic pulse sequence like this, no damage is done. This shows the period measured (histogram) for each of 100 edges. 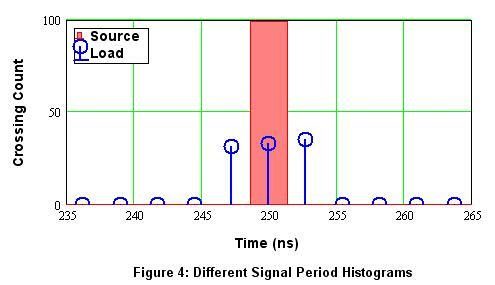 The red box represents the ideal signal and is a single period; the box’s width merely makes it easier to see. The blue stem line represents the signal at the load after reflection. If any period was not exactly 250 ns we would see additional spikes in the histogram. In this case, both ideal and load signals have 100 “hits” at 250 ns, with no errors. As I am tired of making pictures, you’ll have to trust me when I say changing the phase of the reverse wave (moving it with respect to the forward wave) does not matter – a perfect histogram still results. Figure 2. Period histogram of crossings for ideal (red) and load (blue) signals. While there are many things that can cause variation in even a regular pulse train, let’s move on and consider what happens when the forward and reverse signals are different. After all, a real digital bit stream is not a regular sequence, but varies with the signal. There may be random-length strings of 1’s and 0’s distributed among the signal stream, so in general the signal is not at all regular and periodic like the first example. Figure 3 shows a reverse signal (blue) three times the length of the source (red). To simplify the simulation, I made it a regular sequence as well, but of course in real life both streams will look essentially random (a function of the signal). In this example, the reverse wave interacts with the bit stream along the cable. 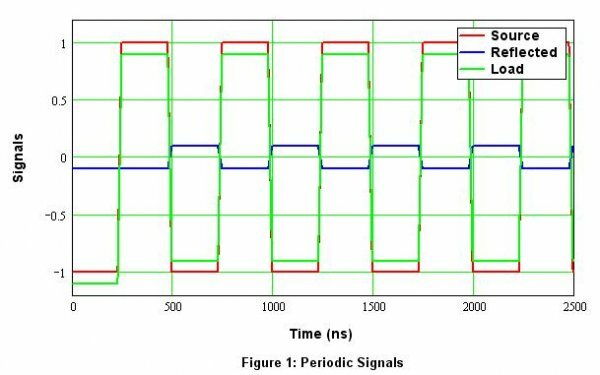 We’ll look at the period assuming the bit stream alternates between a stream of single 0/1 transitions (0,1,0,1…) and a 000/111 sequence (0,0,0,1,1,1,0,0,0,1,1,1,…) Notice the output signal (green) is now modulated with the reverse signal. With real data, the forward and reverse signals will in general be different. We again care about what happens at the load, where the two streams interact and the resultant signal is measured by the receiver. Figure 4 shows the resulting histogram. Now, the ideal source still has only one bin centered at 250 ns as expected. However, the load signal is now distributed into three bins, indicating three slightly different periods. This is deterministic jitter – that is, jitter related to the signal (and clock) period, length of cable, amount of mismatch, etc. Figure 4. Period histogram with different forward and reverse signals. So long as the jitter is fairly small, the receiver will have no problem capturing the right data bits. With a 250 ns bit period, no practical receiver would have issues getting the bits right with just a few ns of jitter as shown in this example. The problem comes when those edges are used to generate the clock for (e.g.) a DAC. The clock circuit will tend to reject small random movements (random jitter), but when patterns like this occur due to a combination of signal bits, clock rate, impedance mismatches, and cable length (among other things), the clock circuit may actually follow the periodic variations and change the clock period accordingly. It has no way of knowing the deterministic jitter is not clock drift, and we get jitter in the output of our DAC. Bummer! Of course, in the real world there will many different periods and thus many bins of various magnitudes. The jitter threads delve into the magnitude of jitter that might cause problems. In this case, the magnitude is a function of the mismatches among source, load, and cable in the link. Clearly, or perhaps not so clearly, if the cable is the right multiple of the clock frequency (bit period), then any “glitches” will happen at the same time and again no harm done. In general, that is very difficult, as there are a myriad of parameters to control – many of which are in fact beyond our control – and of course the critical length will be different for each data (bit) rate. That evil Steve Nugent guy ( ) recommends using a 1.5 meter cable to help deal with the reflections. Does that look like a good idea? I should test that some day. For now, the rise time of the signal varies with the source so a definitive statement can't be made. In a perfectly-matched system it doesn't matter. However, in the real world, nothing's perfect. There is this thing called triple-transit time that is important in the world of transmission lines. The transmitter launches a signal (a bit) and it travels to the other end of the line to the receiver; the first transit. Assuming it is not perfectly matched, then a reflection is generated that travels back to the transmitter -- the second transit. Finally, again assuming imperfect matching to the cable, the reflection of that first bit signal travels back to the receiver, the third transit. Now the original signal, delayed by its trips back and forth, hits the receiver again, attenuated and at a different phase (point in time). That means it will change (interact with) the signal at the receiver, the signal caused by a later bit in the data stream from the transmitter arriving at the receiver as the current (present) bit. It can increase or decrease the received signal to an extent depending upon the amplitude of the reflected signal and thus change the amplitude of the "present" bit. What matters now is how large the reflection, its polarity, and at what time it arrives in relation to the present bit. For this argument, if the reflected signal arrives in the middle of the "flat" region of the signal in the diagrams above, and is not too large, then it won't change the value of the received bit. That is, the reflected wave will cause a bump in the level, up or down, as shown in Figure 3. A peak won't matter; a dip won't matter unless it is large enough to cut the signal in half and cross the center point; that is what determines if the bit is a "1" or a "0". That is pretty unlikely. If the reflected wave arrives on an edge, it will create a little bump in the edge, and that will shift the crossing time a little. That matters because the clock signal is derived from the data stream, so a glitch on the edge leads to a shift in the clock, and that is one definition of time jitter. 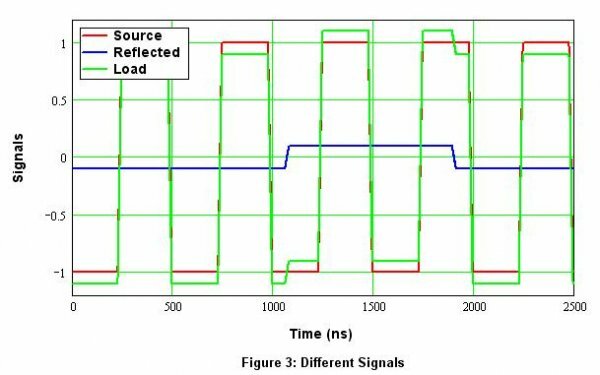 In a digital clock driving a DAC, If there is not a good clock recovery circuit that can reject this jitter, it will be passed along to the DAC and added to the analog output. This is the problem with a synchronous system dependent upon the input clock; any jitter on that clock goes straight to the output signal and reduces the (analog) SNR. So, you want to both reduce the amplitude of reflections, and ensure whatever is left does not happen on an edge. For the assumptions Steve makes on the slew rate and cable transit time (some fraction of the speed of light), it turns out the 1.5 m is a magic length. Shorter, and the the reflections are larger and ill-timed; longer, and reflections will be somewhat attenuated by the cable's capacitance so less a problem. Note the "magic" length should be odd multiples, so if 1.5 m works, then 4.5 m, 7.5 m, etc will also be "perfect" lengths. Don, thanks for putting up this excellent presentation. [...], but when patterns like this occur due to a combination of signal bits, clock rate, impedance mismatches, and cable length (among other things), the clock circuit may actually follow the periodic variations and change the clock period accordingly. It has no way of knowing the deterministic jitter is not clock drift, and we get jitter in the output of our DAC. Bummer! (underline mine) This seems to be your core statement, right? The jitter is strongest when the reflections hit the receiver either within the current transition time or within any of the following transition time windows. High edge rate has shorter transition times (shorter=>less likely to cause jitter from superimposed "DC" and noise) but any reflections will also be more pronounced. So the ideal cable system for a specific sample rate would be one with a reasonably fast edge rate or even shaped response (raised cosine edges / linear phase Bessel lowpass, maybe) combined with a specific cable length (not longer that necessary) that places any reflections from Z mismatch somewhat after the transition time windows so that they don't affect the current transition anymore and there still is maximum time for settling before the next transition window opens where the system is most vulnerable. Does this sound like a proper summary of your investigation? The basic 'optimum cable length' calculations should give reasonable starting points. Only way to really know, though, is to measure right at the input pins of the chip in charge. Is this before or after the cable has been burned in and settled? Also, audiophile cable supports are essential. As a rule of thumb the veil lifting sonic qualities of cables are proportional to cost you should budget an equal amount to the cost of your car per metre of cable. Much silliness has been in ASR lately with a lot of effort devoted to (again and again and again) debunk myths... This great article won't put any nails in the proverbial coffins but I 'd like to see these thinly disguised trolling swatted down from their start. Enough already! No measurements? No proofs? NOT here! In a hurry, busy, so... "yes", you are correct. Mental note: Don't drink English water. Scottish Water of Life is fine, and helps greatly with the audio qualities of any system. 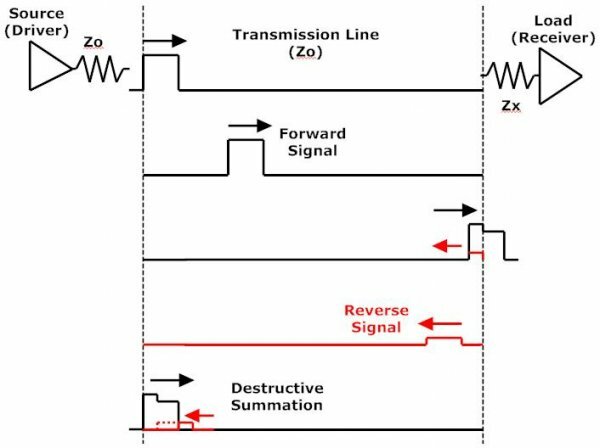 The reflected signal can be either polarity. If the termination impedance is higher than the cable impedance, the reflection will be non-inverted. If the termination impedance is lower than the cable impedance, the reflection will be inverted. Damage is done to the signal at the receiver after the signal has made 3 transits through the cable. The magnitude and polarity of the first reflection is determined by the impedance matching of the termination at the receiver. This first reflection will be reflected again if the drive impedance is mismatched to the cable. The magnitude and polarity of this reflection is determined by the matching of the source impedance to that of the cable. Each successive reflection is smaller than the previous reflection. A perfect termination at the transmitter or the receiver, will eliminate 3rd transit reflections. The 1.5 meter cable is long enough to allow completion of the rise or fall time before the third reflection reaches the receiver. A 1.5 m cable will have a transit time of 5.95 ns to 9.35 ns depending upon the velocity factor of coax used. The transit time through 1.5 meters of air would be about 5 ns (velocity factor of about 1). The velocity factor is determined by the insulating material used in the coax. Multiply the transit times by 3 to calculate the arrival time of the third transit. Multiply the transit time by 2 to arrive at the timing of the third transit relative to the original signal reaching the receiver. The first transit arrives at the receiver 5.95 to 9.35 ns after the original signal is generated. The third transit arrives 17.9 ns to 28 ns after the original signal is generated. The difference in arrival time is 2 transits which is 11.9 ns to 18.7 ns respectively. If the rise time of the original signal is less than 11.9 ns the reflections will arrive after the transition has completed and the reflections will have no impact on the timing of the data transition (assuming the use of the cable with the higher velocity factor). RG59 is commonly used for digital audio, and its lower velocity factor gives us 18.7 ns between the original signal and the reflected signal (at a cable length of 1.5 m). Slower cables give us more margin at 1.5 meters, but things start to get complicated when we look at longer cables. 1: The rise times of the transitions will get longer due to high-frequency roll off. This makes clock recovery more difficult. 2: If 2 transits through the cable is equal to the period of data transitions, the third transit will arrive in sync with the next data transition. In AES or SPDIF digital audio streams, data transitions happen 128 times per sample. 128 x 44,100 = 5.6448 MHz. This means that there is a 177 ns spacing between data edges at a sample rate of 44.1 kHz. If the two-transit time is equal to 177 ns, the terminations need to be reasonably good. Using RG59, this unfortunate alignment happens when the cable length is 9.5 m long. Using the fastest coax, this problem would occur at a length of 14.9 meters. Divide these lengths by two for 88.2 kHz audio, and divide by two again for 176.4 kHz audio. At 192 kHz, using the slowest coax, the reflections will align at a cable length of 2.2 meters. If we consider the fact that transitions have a rise time, interference will begin at shorter cable lengths. This interference will begin if the cable length is much over 1.5 meters long. Bottom line: You can get away with really bad terminations (or no terminations at all) if your cable is 1.5 meters long. There is very little margin in either direction (longer or shorter). For this reason, cable length is a bad way to solve the problem. Nevertheless, a 1.5 meter cable can be used as a band-aid on a poorly designed system. The best way to solve the problem is to use cables that have the correct impedance. The equipment must also have reasonably good terminations on either the transmitter or the receiver (preferably both). 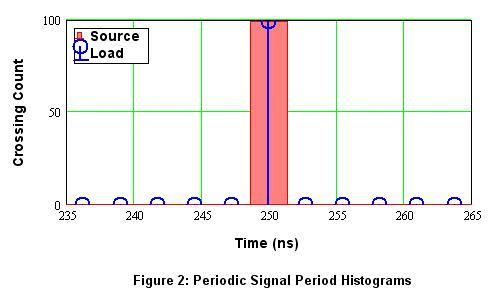 The receiving device should also have a good clock recovery system that provides jitter immunity. If these conditions are satisfied, the cable length is not critical.